This is another of the first posts on this blog that I’ve revised. It describes an incident from many years ago, but the experience gave me an image of healing that has never left. I come back to it again and again whenever I need to push off the weight of depression. My wife and I were hiking with three friends into the back country of the Grand Canyon to spend a couple of nights at Phantom Creek. Most people hiking into the Canyon for a day trip go down the main trail from either north or south rim and wind up at Phantom Ranch, where the Bright Angel Creek joins the Colorado River. (Phantom, Bright Angel, who came up with these spirit names?) Our trip started in just that way, but then Ken, who was guiding us, found a trace of trail next to a campground, and we switch-backed our way up a steep hillside – hoisting our heavy backpacks on ropes at one hard-angled spot. The heat was at a 100 or so, and, having already spent hours on the initial descent down to the Colorado, we strained and groaned in the early evening up that slope onto a natural shelf of long, broad boulders. In that unlikely spot we made camp, in sight of a good starting point for the morning. As I lay uncomfortably on that craggy stone surface, looked back down the canyon at face after shadowed face of massive rock, reddened and purpled in the late summer day’s very last light, my mind was rapidly darkening and an anger was rising that I wasn’t even aware of. Those towering cliffs suddenly seemed threatening, and I felt completely out of place. I couldn’t help saying aloud, though it was far from the camaraderie and happy escapism of our little adventure, What on earth are we doing in this barren place? I could see what was happening until the next day, but the depression seemed to worsen overnight. Waking on rock, we got an early start, climbing up a craggy slope to reach a ridge covered with boulders and cactus where the trail disappeared. The sun climbed with us, and the heat penetrated mind and body after a couple of hours. I was still aching after the previous day’s descent and suddenly I was seeing the worst in everything. Like the others, I tediously picked my way through cactus thorns and rock edges, sliding backwards on a bit of gravel every now and then, lurching into balance with the heavy backpack. It was sweaty torture in the 100+ degree heat. Then an inner rage started to pour out of me. This had happened before on hikes into the Canyon, a purging of every negative thought and feeling, dark clouds through and through my mind. Every muscle started to ache, I had to stop more and more often in the heat, and a stream of acid thought kept eating into everything I was, everyone I knew. My wife and friends disappeared in the haze of fatigue and disgust and a kind of bile I could taste. Every step I took felt like a blow against some idiot who had angered or hurt me, every thought a comeback I had failed to make, every breath a wheezing out of hate. Though I thought I had been falling behind the others, I stopped at one point near the top of the ridge and looked back to see them working their way carefully through the last of the cactus, chatting and laughing as they went. I felt badly that I was so out of synch with them, so full of anger and discomfort (another reason to beat myself up), but I couldn’t shake it, couldn’t get out of that smothering embrace of what felt like an evil twin. A mile, when I couldn’t move at all! I just stood still – adamant. “I’m not moving another step.” My tone and barely suppressed fury were immediately obvious to the others. They just marched on, ignoring what I’d said, removing their shoes, stepping through the shallow creek and quickly heading up the trail. I planted myself there for a moment and tried desperately to summon one bit of energy, just to get across the creek. Finally, I bent down to get out of my shoes and liberate my sore feet. I took the hiking shoes in one hand and stepped into the water. Then something happened. 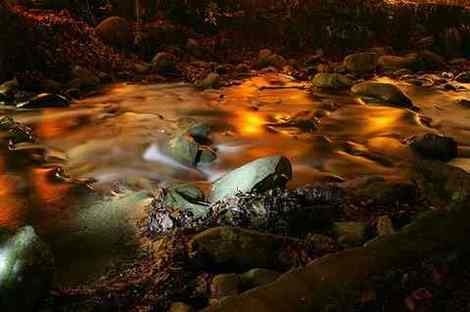 The cold water of the shallow creek – running just a few inches deep – trickled over my bare feet, and in the few seconds of my quick steps to the other side washed out that stain of anger, exhaustion and hurt. The heaviness of it all dissolved in the cleansing swirl of tiny currents, and I felt completely light and buoyant, full of energy. My mind dawned again, and I knew I had taken back my own self, after a strange captivity elsewhere. I stopped on the far side of the creek, sat on a flat rock to put my shoes and socks on, and just stared at that small motioning stream, as if looking at the outside of a complicated machine, trying to understand how it worked. What the hell was that? I was puzzled but elated, thinking maybe I should do that again, walk back and forth a few times, but no I didn’t do that. Whatever the stream had done to me was complete. It had simply healing me. It was an instant of strange warmth in a cold stream that restored a deadening soul. What spirit was hiding in there? How could this be? That’s all it was, a moment that was over before I could even grasp what was happening. One moment I am as heavy as gravel, then I’m light and vibrant. Why? I hurried up the trail to share the good news. Of course, when I caught up to them, busy in setting up camp, it was hard to find any words. All I could say was something like, I’m back! – and I hoped they would see what I meant. This blog is fantasitic , great visuals , keep up the good work. Ameli – Thanks for coming by – hope we can talk soon. Clinically Clueless – Yes, I do feel that these incidents are spiritual. I only hinted at that in this post – I think because it was one of the very first, and I wasn’t yet ready to go into that world very deeply. I’m glad you liked it! Chunks – It’s strange how anger and rage can be triggered in me by hard work. Going into the canyon with sixty pounds on your back is hard – and all that anger is like a purging of every frustration and hurt I can summon to mind. It’s like emotional sweat – a waste product – and when I’m emptied of it I can be human again. I don’t think it’s getting totally exhausted that does it – it’s more like the extraordinary physical effort wakens something in me that’s been trying to get out. I’m shaken up enough physically that I’m no longer even trying to hold it back. I’m guessing here – it’s really mysterious. Hello, Dano – Your underwater experiences sound wonderful – I’m sorry you aren’t able to do that anymore. I must say that, as a Tewa friend used to put it, I’m an earth surface person. Wading through a stream, splashing in the waves at the shore, even rafting on a river – all that’s fine, but underwater is not my place. Perhaps it’s the womb symbol for you – for me it’s the unconscious sphere I’m afraid I’ll drown in. Interesting how we all go about with our own symbol worlds of comfort and fear – and each so different. That was beautiful both the writing and the experience. The only experiences that I’ve had like that are Spiritual ones, but I see water as spiritual. Moving, living, breathing, cleansing and refreshing spirit. Great story, Im gonna check out this page thanks for your support. My gawd, John, the writing, the beautiful imagery and the gorgeous picture you found! You just continue to bowl me over when I visit. It was strange reading this post because I had such a visceral reaction to it. I completely felt the anger and know exactly what you are talking about. I remember hiking out of a cave a few years back and being completely exhausted and tired out and not wanting to take another step to get out of that cave. When I become highly angry and frustrated and when I’m completely tired I just bust out crying and that is what I did. I was the last one out of that cave and completely embarrassed. I have figured out that I get that way when I feel so physically weak that I feel I have no control over myself. Did you ever figure out where the anger came from? Could it be the same? Water is truly an amazing gift. I miss read your title, thing it said “Grand Cayman”! I have spent a lot of time SCUBA diving in Grand Cayman, something I can’t do now, due to my meds. Being underwater is one of the greatest pleasures I have experienced. I have always felt a peace, as if I am where I am supposed to be. I know, I know, the womb, yadda yadda. I loved your story, which I read as if experiencing the hurt and the rage. Saw the sun setting and the cool blessing of the water. If I ever get out there, I’ll have to re-read this post, so I’ll know what to look for. I hope that you are enjoying a lovely new year. Wonderful story John! I’ve had similar experiences, though not from a stream. I like the darkness of night, and often, after walking outside at 3:00 am I am invigorated by the night air coming off the ocean–it seems to have a magical quality.